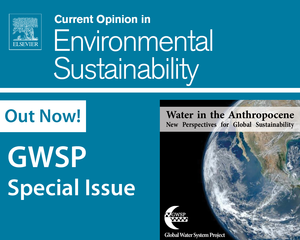 This special issue is the first in the Current Opinion in Environmental Sustainability Journal (Volume 5, Issue 6, December 2013) to take as its organising principal the unique role that humans play in shaping the character of water systems, both today and into the future. It represents one of the chief products to emerge from the Water in the Anthropocene Conference, which brought together over 350 scientists, scholars, practitioners and policy makers, who for nearly a week presented the newest in interdisciplinary water research organised around more than 20 different themes. This special issue is presented as a collection of 19 thematic papers treating three major themes, the same as those used to structure the Bonn Conference. What are the new knowledge and perspectives developed over the last decade with respect to the global state of water resources and water governance? What are the key new ideas and insights and how are these different than at the turn of the century? How did the global water community contribute to this new thinking? How well does the new thinking prepare us for future studies on water and its role in society and the Earth system? Taken together, the Conference program and papers, the Bonn Declaration on Global Water Security, this Special Issue and a decade of GWSP activities show that, beyond any reasonable doubt, direct human actions involving the planet’s water systems are increasingly debilitating the very environmental systems on which humankind must rely for an essential strategic resource – fresh water. Ecosystem services — a useful concept for addressing water challenges?